Moreton Bay Sports Club is a local non-profit community sports club open 7 days a week. It is the main venue to Wolves FC, The Wynnum Manly Cricket Club and Wynnum District Darts Club. With multiple dining options from sit down meals to finger foods for less formal wedding affairs. We can cater for up to 130 sit down guests or 180 as an informal cocktail party. 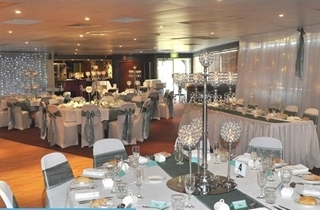 From basic decorations to elegant themed functions. Full bar facilities available and your personal Function Coordinator for your special occasion. Whatever your requirements or budget we can assist. The Panorama Room caters for events from 50 - 120 seated or 200 guests for a cocktail style event. The Panorama Room has its own private bar, male and female toilet facilities and private smokers balcony. The Panorama Room is perfect for medium to large wedding receptions. Moreton Bay Sports Club has the facilities, friendly staff and excellent service standards to ensure your event is a memorable one.